The wannabe lovechild of Porter Wagoner and Wanda Jackson, Rusty Ford wants to bring country music a bouquet of flowers and give her a hickey. Based in Vancouver, Canada, Rusty Ford is singer-songwriter whose unique tunes are a saucy salute to the golden age of classic country. Inspired by a gag email of the top ten worst country songs never written, his hilarious titles include "I Hate Every Bone in Your Body Except Mine", and "I Miss You But My Aim's Improving". 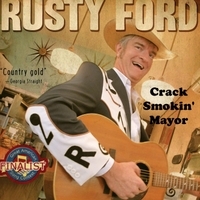 Rusty”s latest single is a satirical tribute to celebrity Toronto Mayor Rob Ford, “Crack Smokin’ Mayor”.